Before I address the new ride at Universal Hollywood, I want to discuss Universal's obsession (fetish?) with spraying people in the face with water. I understand that to enrich the ride/show experience for visitors, you want to fully immerse them in the experience. While riding the Jurassic Park water ride at Universal, I fully expect to get a faceful of water...and then some. It's the other places in the park where I didn't expect or desire to get a faceful of water. Let's review the places where I "took it on the chin." The Mummy -- c'mon...I want a roller coaster here. Transformers -- Completely distracts from the awesomeness. Back-lot tram tour -- Yes...they've added a full-face-soak to the ride people over the age of 80 enjoy most. "And here, we have the set from Back to the Future"---blammmooo!!" How'd you like that one? How's a steady rush of water in your eyeballs while you try to enjoy Wysteria Lane? This confounds me. From the hole in the stall of the mens restroom -- My therapist said I shouldn't discuss this. Please Universal...let's tone it down with the water spray. By the end of the day, my mascara and my Spongebob paint-on-tattoo were dripping heavily down my face. Let's stop the insanity. 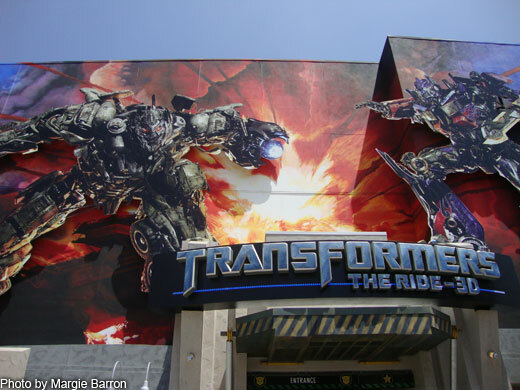 Despite the steady onslaught of money shots, Universal Hollywood has created an attraction masterpiece with their new Transformers ride. I'll cover the areas of enjoyment below. movement. Their clumsy movements make the Small Wonder seem completely lifelike. The line queue is put together well. The "back-story" is basic enough to follow via the movie clips, and there are enough lights, props, and rooms to keep you engaged. Big plus. Wait times -- The biggest waste of time in Southern California is the line queue for Toy Story Midway Mania in Disneyland California Adventure. You weave around the same group of ropes...seeing and smelling the same group of people for about an hour. You then board the ride to play a video game for 5 minutes. Complete disappointment. The Transformers line moves fairly quick, and takes you to new rooms to keep you occupied. It is the anti-Toy Story. Luckily, our wait times never exceeded 20 minutes, even though the ride was fairly new and it was summer break. Monster plus. Germ-a-phobe -- I cannot bear to board a ride where my hands have to grasp a bar stickier than a stripper pole. This will single-handedly ruin a ride. Transformers passes the test, as you don't really need to hold on anywhere. Ride Experience -- Universal has dropped a complete smack-down on Disney here. If the Indiana Jones ride hooked up with Star Tours while on crack in Tijauna, Transformers would be their baby. Basically, you're in a car that moves at different speeds through multiple 3D movie screens. The seamless 3-D movie moving from screen to screen, coupled with the motion of the car is amazing. It is a completely immersible experience. I can't describe the ride...so just go. Acting -- The worst part of the Transformers movies was how terribly bland they made Optimus Prime. His aloof comments and tone were maddening. You will see more during this ride. Universal really needs to re-dub his voice with something else. Let Robin Williams do it. When Optimus thanks you for saving the planet at the end of the ride, I expected him to ask if we wanted fries with the ride as well. At least they left Shia Lebouf out of this chapter. This ride is worth the trip to Universal alone. If you are into water-play, then all the other rides will make your day even more enjoyable.